Arsenal fans were not in the slightest bit happy when it was revealed yesterday that the Gunners had agreed a fee with Chelsea for the transfer of Alex Oxlade-Chamberlain, but they will be even more amazed to learn that the 24 year-old has turned down the chance to move to Stamford Bridge because he has every intention of linking up with Jurgen Klopp at Liverpool. A BBC report states: Arsenal’s Alex Oxlade-Chamberlain has turned down a move to Chelsea after the Premier League clubs agreed a £40m fee. The 24-year-old England international wants to move to Liverpool. A bid from the Reds is expected before Thursday’s transfer deadline, although it is likely to be below the price Chelsea were willing to pay. sell him don’t wanna see him near the squad again. its was so embarrassing to see him put up that sort of performance against pool. If he doesn’t move, let him end up in the reserve team. but don’t sell him to pool, force him to Chelsea. ….so, he underperformed on sunday because now he loves liverpool and not Arsenal anymore.! If Chamberlain does leave, Porto’s Ricardo Pereira would be a great replacement in the right wingback position. I saw him played with high skills for Nice last season. Maybe he thinks he could replace Coutinho at Liverpool? I’m sure Klopp can use his talent better than Wenger. Losing him is a huge loss for Arsenal. So Arsenal should get some money from his transfer or get nothing at the end of the season. OMG the ox really has become something. Turning down Chelski because he wants to play in the centre. He played his best football for us as a RWB in a handful of games at the end of last season. Let him go and make a mug of himself. The Ox is surely confused and childish! This is what happens to footballers with greedy and stupid agents! Chelsea will never have agreed a deal with Arsenal for him without his agent playing a role in it. personally, I will prefer we just sell him to any club he desires and move on from all these transfer madness…I am starting to get pissed!! Why can’t Wenger keep his word? He said Ox and Sanchez are not for sale, and now 2 days to deadline day they are there on the shopping cart. Why does he always lie? Van Persie and other stars were sold after himself confirming to fans that they won’t be sold? Ambitious teams get hold of their star players but we are happily selling them every window to make profit for the clueless manager and his bosses. These two including Ozil could have been sold very early in the transfer window when they showed all signs of arrogance, but Wenger was sure they are staying. Who are going to be their replacements now that every player in the world knows Arsenal is a sinking ship and no one wants to come? I am surprised by your surprise at this situation.. Thanks for returning so many years of loyalty, Ox! Knowing he doesn’t want to go to Chelsea, Liverpool will now make a ridiculously low bid and Arsenal will have to decide whether to take it or let him go for free next year. I know it doesn’t make any economic sense, but I would say this to the Ox: either you go to the team with the highest bid – at this moment Chelsea – or we keep you at Arsenal as a benched squad player in the under-23s and bury your chances of playing for England in the next World Cup, and explain to him that when he does go for free, it’ll be to a club like West Brom on a quarter of the wage Chelsea are prepared to play. The only way to deal with such blind greed and inflated ego is to take the toughest line possible. Please no one should disrespect The OX. Fans sais same things about RvP, Hleb, Nasri, Fabregas, Adebayor. The way Arsenal is being run now, we’ll rather loose/ replace all our players than loose Wenger. Sad reality. Except that everyone of those ‘snakes’ you listed, actually managed to contribute to the Arsenal team. RVP, Fabregas, Nasri, Adebayor.. they all scored a lot of goals for us. Meanwhile, OX scored 6 goals last season and that was HIS RECORD. His mediocre displays most times and Wenger faith in him have been part of the club’s problems. If we’ve had a good manager over the couple if years some of these players wouldn’t have been here and we wouldn’t have found ourselves in such a pitiable situation. Arsene is a fraud lier. You don’t let 100 million of talent leave for free. We were always going to sell Sanchez. It’s madness that we’re doing it on the last 2 days of the window, but that’s Arsenal, Madness is alright here! Wenger OUT, OUT, OUT and take Gazidis and Kroenke with you. Please just go anywhere you like, we don’t need you again. He will be a flop in Liverpool, better players like Naby Keita (when he comes to Liverpool next season) and others midfielders will always sit him on the bench. I just wish Arsenal gets A VERY GOOD REPLACEMENT. 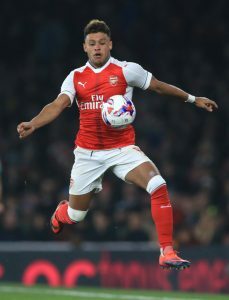 The Ox, Sanchez and others are well paid footballers they should be performing without being motivating by Wenger. The average Joe on £7.25 per hour would work his sock off if he was on their salaries. Let them go and get players who want to play for Arsenal. The Ox and otherd hasn”t scored enough goals apart from Sanchez, Giroud and Wallcott. Good riddance to the fool! He deliberately underperformed against Liverpool and when you see some of his running back and marking you won’t be able to disagree. Get the fool out of the club now! Useless player anyway. Isn’t his girlfriend a scouser? Probably under the thumb and his girlfriend ordered him to play bad- pathetic. I just read that Grzegorz Krychowiak, a man who not too long ago featured in the La Liga Team of the Year, is in loan talks with… WBA!! F’n WBA is getting a better midfielder what we have. WHY ISN’T LE FRAUD STEPPING IN?! He would be perfect for us. The fact that Pool beat us on Sunday doesn’t mean they r better than us. The Ox going to Pool is a step backwards. How much is Theo worth?